Never say never. I said just a while ago that this winter gas prices for end-consumers wouldn’t grow by more than 15% compared to the average price in the warm season. The statement was based on the price established through the transactions concluded on the exchange during summer with delivery in winter and which showed an increase by around 7% in the price of gas from domestic production, added to which was the storage cost and the import cost for days with peak consumption. Surprise! As a year ago electricity prices have gone crazy, now gas prices also show signs that they follow the steps of electricity prices in the previous year. Even if the Competition Council has this information, it does not seem to consider analyzing and signaling a potential problem in the market. In absence of this signal, I allow myself to make a subjective and intuitive forecast, that the price of natural gas from domestic production gives signs to open January at RON 100/MWh. 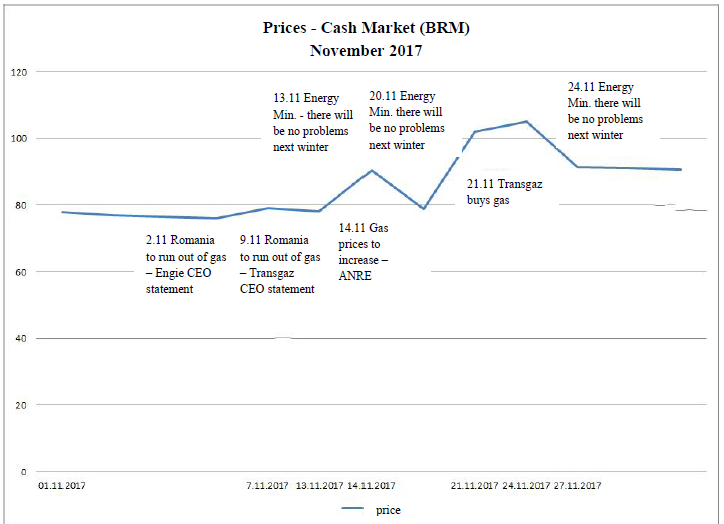 We observed in the last days of November on BRM’s Cash Market a number of “interesting” transactions, well beyond the trading price around the value of RON 76-78/MWh. A first transaction that comes out of this range, apparently without any explanation (at least at the level of public information) was the acquisition of gas from domestic production made on 14 November 2017, at a price of RON 90.5/MWh (gas to be delivered in December 2017). These amounts were purchased for the regulated market, thus having the advantage given by how the legislation currently allows that gas bills be covered by recognizing the costs and reflecting the costs in the regulated price. Such a position in the market outlines the first price inflation trend, and gives the buyer (gas supplier to household customers) the advantage of covering the risks with the purchase of gas that it couldn’t sell in the free market, due to the higher price compared to the selling price. On the same day there was another transaction of gas acquisition from domestic production, for December 2017 and Q1/2018, at a price of RON 102/MWh, performed by a company with majority state capital, without having a gas supply activity. I believe that this transaction irrevocably points to the change of the gas price trend curve on the Romanian market in the winter of 2017/2018. It is my opinion that risks with the acquisition of gas that couldn’t be sold in the market due to a price higher than the selling price (at the time of purchase) were also covered, due to the regulated activity of this operator. 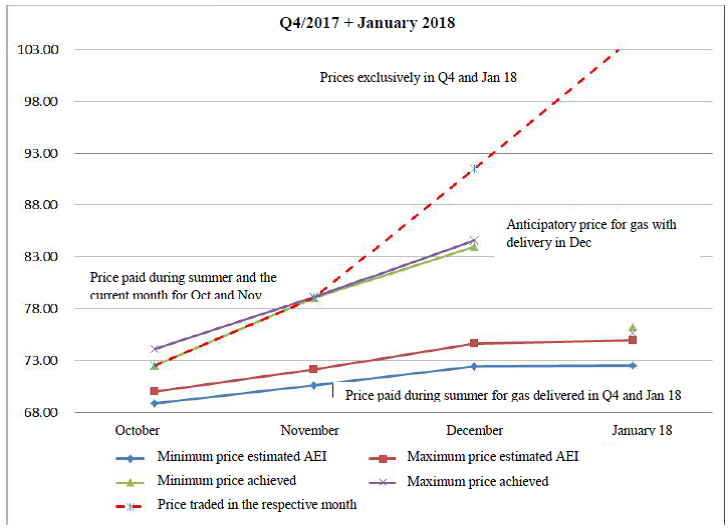 After other 10 days, a new gas acquisition was made from the domestic production with delivery in January 2018, by the same company that 10 days before had increased the price of gas by 16% (to RON 90.5/MWh) and which supplies gas mainly to population, gas being purchased at a price of RON 105/MWh (there are rumors even that the gas amounts were sold between two companies that have the same owner!). The apparition of these positions on the market, doubled by the presence of a company with majority state capital in this equation, has created emotion on the gas market and determined a reaction of all players to align (trade) with the new price levels imposed. Thus, the idea that the price increase trend is certain takes shape quickly and determines a credibility of this new position of the market price. A similar situation, having almost the same protagonists, also happened two years ago on the Romanian market. Thus, an operator with majority state capital that has no activity on the gas market (through sale/purchase operations), which has the risks of gas acquisition at prices above the market price covered by the existing legislation, determines a new upward trend in the market and opens the way to imported gas, whose prices were otherwise prohibitive. I would associate these acquisitions above the price of other transactions on BRM with a trend of lifting the price on the gas market, carried out in the past two months as a result of various persuasive actions to induce at the market level the idea of gas crisis in the winter of 2017/2018 and the need to increase gas prices on the gas market. The statements on gas price increase made by various institutions. This alarming situation hasn’t been properly counteracted by the positions of the Ministry of Energy, which although occurred after each alarming position in the market, haven’t been convincing, the proof being the poor takeover in the media of Ministry’s messages. At the same time, the situation that occurred on the exchange (BRM) regarding prices by 36% higher than the other transactions, in conditions of inexistence of a gas crisis or a large difference between supply and demand, hasn’t determined any expression of opinion by those responsible for ensuring competition. Ensuring market competition and preventing any elements that aim at influencing the prices required a continuous monitoring of transactions performed and signaling any potential deviation from the trend, in absence of pressure on quantity, through messages limiting the emotional actions of market participants, following persuasive signals. Such a signal would have attracted the attention of market participants that they should not panic and sell/buy immediately and shape a new price trend, but they should have a prudent behavior, as there are question marks at the level of the authority responsible for ensuring competition on the new price trend.